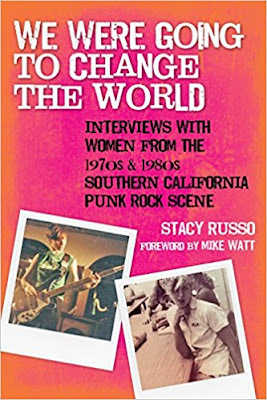 We Were Going To Change The World: Interviews With women from The 1970s & 1980s Southern California Punk Rock Scene by Stacy Russo with a Foreword by Mike Watt. I enjoyed reading everyone’s take on the early punk rock scene. For someone who wasn’t there the stories give a big glimpse of how it was, the good, the bad and the ugly, and for someone who was there, we are reliving some experiences we haven’t thought about in years. Stacy Russo put her heart and soul into this project and I give her credit as it’s not an easy thing to accomplish. I loved the honestly and the true-life moments that was shared, uninhibited. People did not hold back and that’s what I liked most. And of course, the photos were an added bonus. The punk rock scene of the 1970s and ’80s in Southern California is widely acknowledged as one of the most vibrant, creative periods in all of rock and roll history. 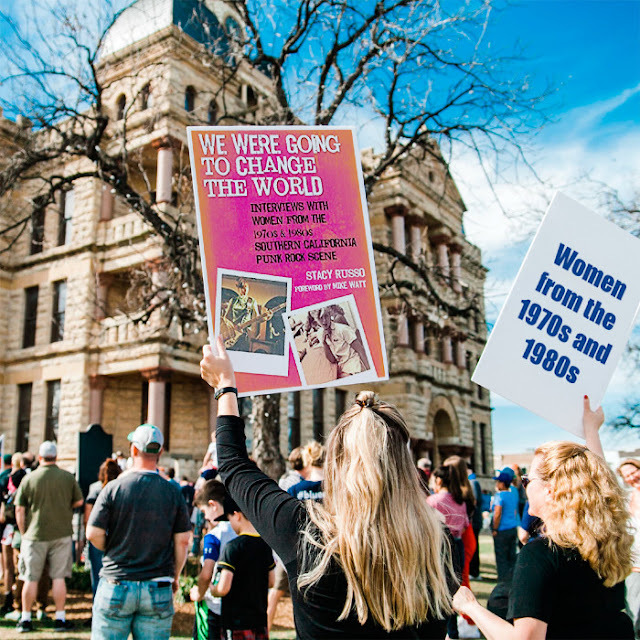 And while many books have covered the artists who contributed to the music of that era, none have exclusively focused on the vitality and influence of the women who played such a crucial role in this incredibly dynamic and instrumental movement. We Were Going to Change the World captures the stories of women who were active in the SoCal punk rock scene during this historic time, adding an important voice to its cultural and musical record. Through exclusive interviews with musicians, journalists, photographers, and fans, Stacy Russo has captured the essence of why these women were drawn to punk rock, what they witnessed, and how their involvement in this empowering scene ended up influencing the rest of their lives. From such hugely influential musicians and performers as Exene Cervenka, Alice Bag, Kira, Phranc, Johanna Went, Teresa Covarrubias, and Jennifer Precious Finch, to such highly regarded journalists, DJs, and photographers as Ann Summa, Jenny Lens, Kristine McKenna, Pleasant Gehman, and Stella, to the fans and scenesters who supported the bands and added so much color and energy to the scene, We Were Going to Change the World is an important oral history of the crucial contributions women injected into the Southern California punk rock scene of the 1970s and ’80s. Empowering, touching, and informative, Stacy Russo’s collection of interviews adds a whole new dimension to the literature of both punk rock and women’s studies. “There have been negative and positive influences from being a punk in that scene. One negative influence was the sexuality that was accepted in that time period. “You can’t walk through life as a women without experiencing sexism. “The scene started out really fun . . . the music, energy, and anarchy of it all. Stacy Russo, a librarian and professor at Santa Ana College in Santa Ana, California, is a poet, writer, and artist. She believes in libraries as community spaces; lifelong learning; poetry; public education; peaceful living; feminism; and the power of personal story. Stacy's books are Love Activism (Litwin Books); We Were Going to Change the World: Interviews with Women from the 1970s and 1980s Southern California Punk Rock Scene (Santa Monica Press); Life as Activism: June Jordan’s Writings from The Progressive (Litwin Books); and The Library as Place in California (McFarland). Stacy's articles, poetry, and reviews have appeared in Feminist Teacher, Feminist Collections, American Libraries, Counterpoise, Library Journal, Chaffey Review, Serials Review, and the anthology Open Doors: An Invitation to Poetry (Chaparral Canyon Press). Her poetry zines include Poems a Librarian Wrote on Her Lunch Break; Young and Hungry in Paradise; and California Wine: Poems for Everybody.